G'Day friends! Old ones and new ones! 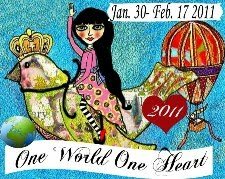 Welcome to my blog 'Antmee' on the One World One heart blog hop! I go by the name of Kylie and live in Murray Bridge, South Australia. I love to buy fabric, lot's of it and so was born the urgent need to start sewing! I found I quite like sewing too, except when things go belly up and needles break on the sewing machine or fabric jams into the machine! I love making functional things like bags and kitchen accessories (Zakka) and cuddly things like softies and sock creatures. Actually I will make anything, even just pretty flowers or fruit. 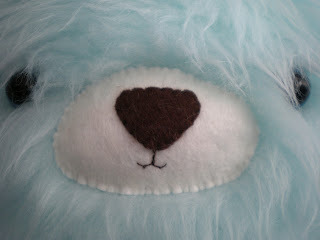 My 'door prize' for this blog hop is the cutest bear I have ever made! I am really happy with how this little cutie turned out as it was the first time I have sewn something using furry fabric. This bear is approximately 50cm/20" tall. So not so small but just right! 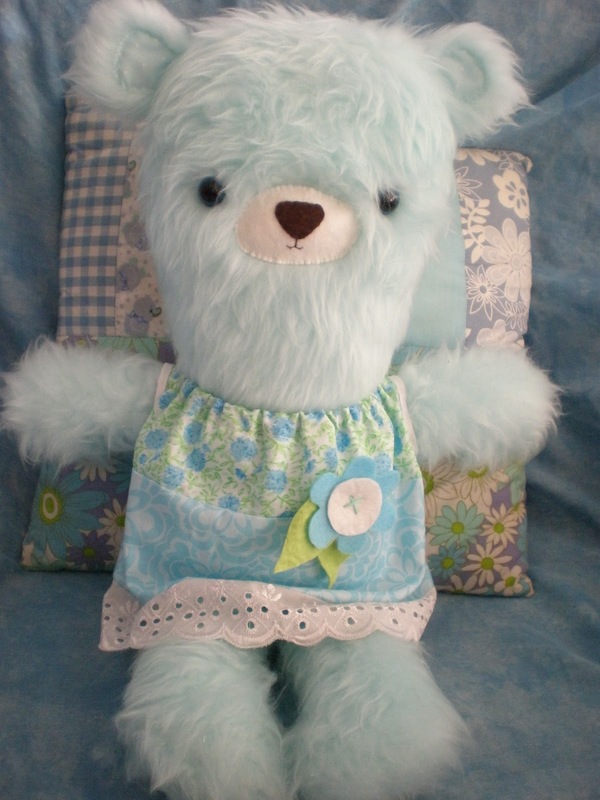 I made this bear especially for this blog hop and I hope you would like to take her home. Just leave a comment with a way for me to contact you and I will pick someone using the random number generator on the 17th Feb. Giveaway is open to everyone that has a active blog and you can live anywhere on Earth. Just for fun, if you can suggest a name for this bear it would be awesome. Thanks for stopping by and I hope you have the best time on Lisa's blog hop! I found this luscious piece of deep red velvet looking plush and immediately decided it would make perfect strawberries. I used this pattern and tutorial from Embroideroo. They turned out a little larger than I wanted and a second look at the tutorial states "pincushion". Should have been a clue to silly me! 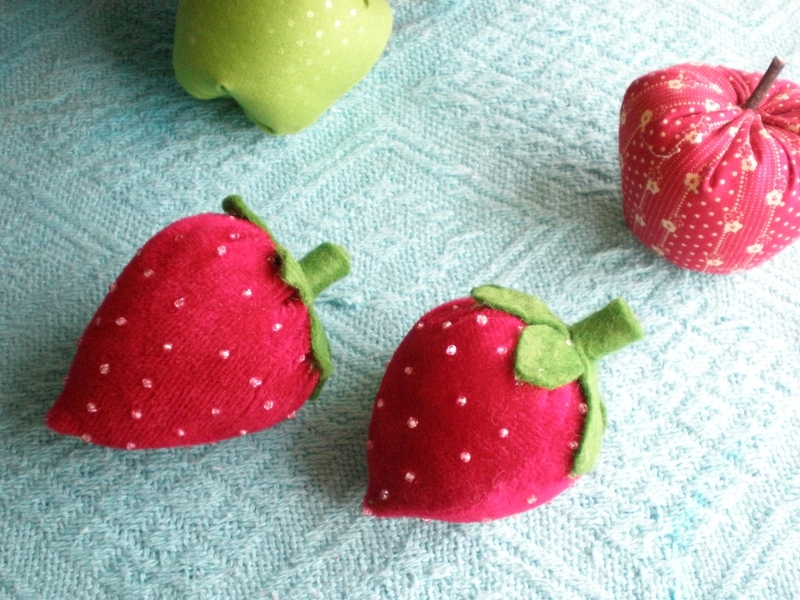 I'll shrink the pattern next time, but they were very nice slack time sewing. I am currently working a project for the OWOH give-away-athon and have one week left to finish but needed a little "time out" project. Yummy fruit hey! 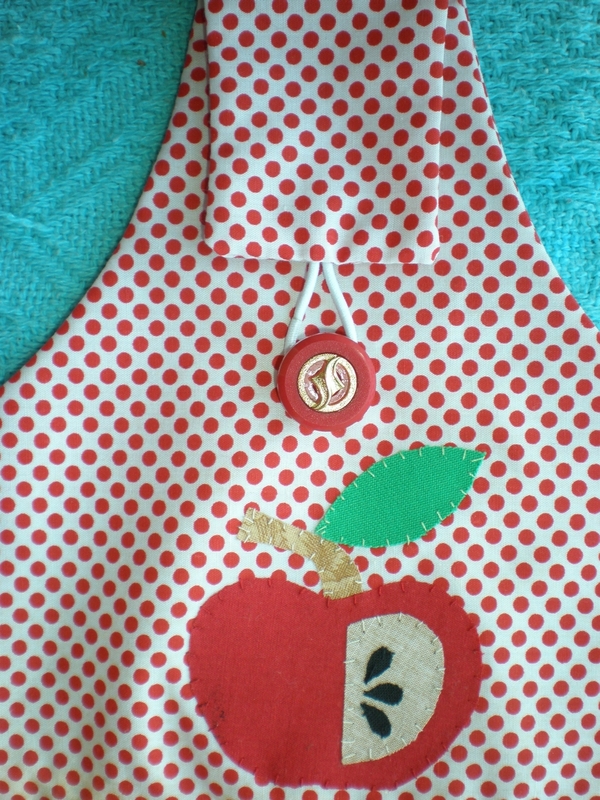 The apples are from a Tilda craft book called Sew Pretty Christmas Homestyle. Hand sewn beads are lovely and wonderful to do while watching TV but knocking the bead container over and spilling thousands of seed beads all over the carpet is not wonderful! I spent ages picking up all those beads instead of just vacuuming them. After all they were only a couple of bucks to buy. I learnt a piece of paper is great for sweeping beads onto and then using as a funnel to pour them back into their container. I got a little carried away making lots of red apples! 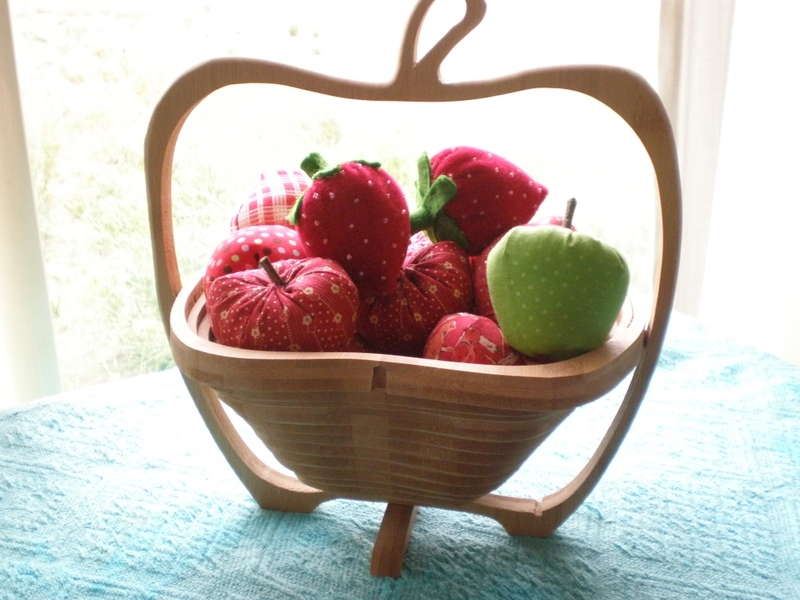 This fruit basket was a freebie from some wine selling merchant that knocked on my door. He did talk me into buying some wine and threw in a free bottle of strawberry wine for me to try. It was so delicious I ordered two cases more of the stuff. Chilled it is the most awesome refreshing summer wine and best of all it has a very low alcohol content so visitors can have a glass and still drive home. Another project to take me away from my OWOH project are these pouches. 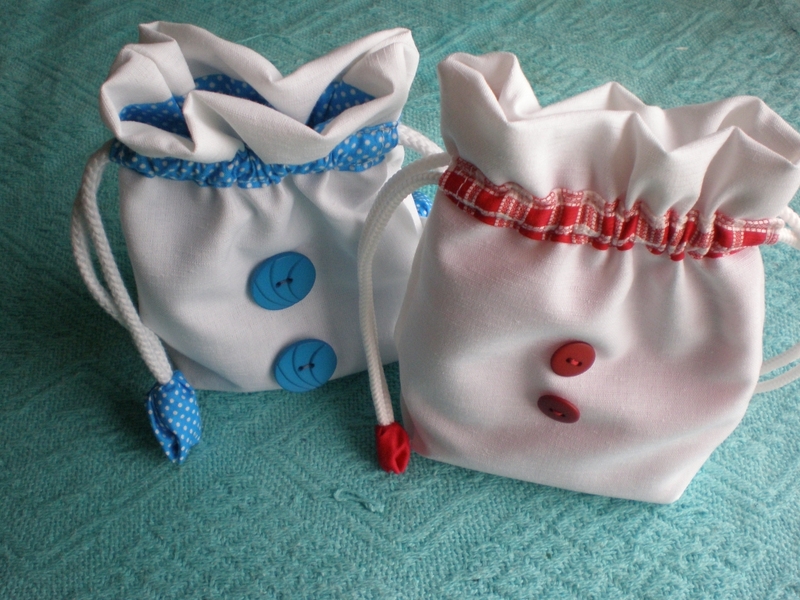 I have made the same size as the tutorial and they are palm size pouches which make good gift bags for little gifts like brooches, hair accessories, jewelery etc. 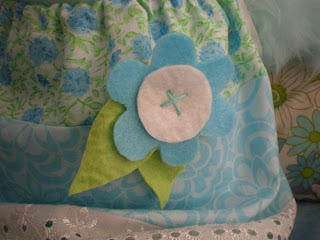 Tutorial was found on a wonderful blog called Maccabags and is quite a well made tutorial with good pictures. For those who joined last year, the fifth and final One World, One Heart begins on 30 January. For those who are new to OWOH it is best if you click on the picture below which will take you to the hosts blog to get all the info. She had over 1000 participants last year. I met a lot of talented people and have been reading their blog ever since. Basically it is a massive get to know you blogathon/ giveaway-athon! It's open to anyone from anywhere as long as they have a "working" blog of their own. I loved it last year. You will love it this year. Come back and see me Jan 30th! After all the sewing and hand stitching of applique for a supposedly quick project I held the iron down on the hem a bit too long. OOps! Scorched the hem. Never burnt a thing before in my life (except dinner and maybe myself!). Oh well! It's only a hand towel that won't last long around my family! I am pretty sure the guys in the house don't dry their hands with towels but wash themselves with them! The towels get so grubby so quickly it drives me nuts. Here's pretty while it lasts! 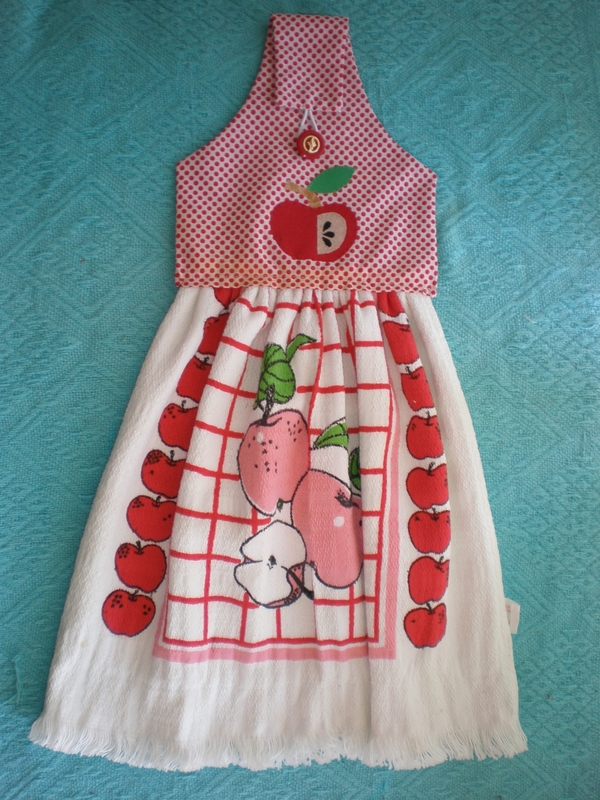 Can you see the scorch mark on the spotty hemline just under the apple? I have washed and washed the towel but the scorch mark remains. I wonder if technology has come up with an iron that has sensors in it to tell idiots like me to lift off the iron? Maybe just one that chants "focus" may help my drifting mind! At least it wasn't on the quilt I am cutting out! 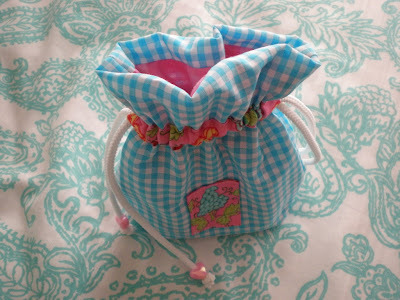 I have been in love with Japanese crafting for quite awhile now and I found a 'you beaut' tutorial on the net for a Japanese Dilly Bag. It was easy and could be made to any size you need. Only takes two pieces of fabric 40x40cm. A bit of Japanese origami folding is needed but the tutorial has clear pictures of each step. It is written in Japanese, but the pics are really easy to follow. A close up of the flower. A Japanese fabric folding flower! These flowers are great at using up scraps of fabric. A side view. If you want to have a go at this bag, the tutorial can be found here. It's quick and pretty as well. UPDATE: link no longer works. New link here. It's my birthday today and guess what I got? Jess (my daughter) gave me Wii fit for my birthday and it calculated my weight as overweight (no surprise) and my fitness age at 57!!!! Yes 57!!!! Bloody insulted on my birthday!!!. But it doesn't stop there! lol Oh no the birthday gift keeps on giving! The blasted machine goes on to say I am unbalanced! My daughter and I had a load of laughs! My dearest hubby gave me a Dyson dc29 for my birthday. I connected the parts together, pressed start and got zapped with a big bolt of electricity! My other half explained the electricity as a static charge that most likely built up because of the oily film coating new appliances and wont persist. I hope so because I really love these gifts! One will get me fitter and the other will clean my carpets better. Year 2011 is the year of a fitter me!